Some of the most spectacular sights of the desert await you just a short drive north of Phoenix and Scottsdale. 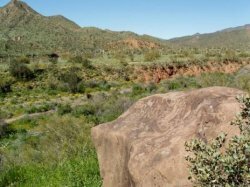 When you feel like leaving the tall buildings and hustle and bustle behind, the places to go for some relaxing fun are the Towns of Carefree and Cave Creek. Vast stretches of the wide-open Sonoran Desert, pristine mountain vistas, giant boulder formations, a sparkling lake and towering saguaro cacti are all part of the magical landscape waiting for you here in one of Arizona’s last frontiers.